When was the last time that a block of tofu was simply irresistible to you? This glazed tofu roast didn’t even make it off of the cutting board. We ate it all. The general idea for this tofu, which I maintain is some of the best tofu I’ve ever made, is to press all of the excess water out of it, and then marinate it for 24+ hours in a sweet and smoky marinade. Use a narrow dish and flip the tofu several times, so that the marinade thoroughly soaks it. 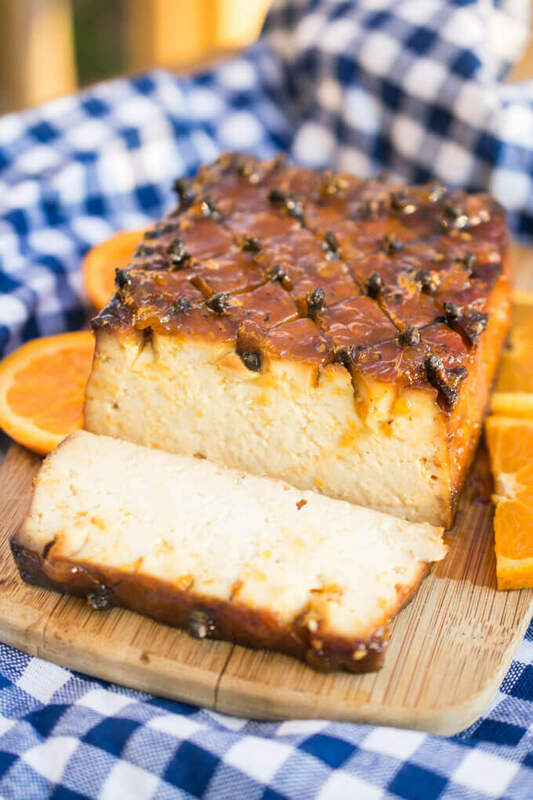 Then, cut a criss-cross pattern on the top, stick some adorable little cloves in the junctions, plop the tofu on a bed of orange slices, and wait an hour. 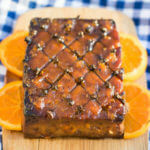 Top with a homemade orange-whiskey glaze (yep) and roast just a little bit longer to set the glaze onto the tofu bake. And then, dig in, and don’t be surprised if you can’t stop going back for more slices. It’s only fair for me to show you the inside. Yes, it looks like regular tofu on the interior but I assure you… while the color may not have changed much, every cubic inch is juicy and delicious with flavor of the marinade. I won’t take credit for the idea to cross-hatch tofu and then bake it with a vegan ham esque glaze. That genius creation comes from Isa Moskowitz’s book, The Superfun Times Holiday Cookbook. It’s an amazing book. I highly recommend picking up a copy! The recipes are organized by holiday theme but they’re generally transcendent and great any time of year. Something I didn’t like about Isa’s tofu ham? The recipe calls for so. much. sugar. I get it – holiday hams are usually sweet, so it’s not unreasonable for a baked tofu centerpiece to have some of that same sweetness. But considering the very real risk of eating the entire thing in a short period of time, I knew I needed to reduce the sugar somewhat. By cutting the sweetener and augmenting some of the other flavors, I came up with an updated glazed tofu roast that I’m really happy with. I also found that it was pretty essential to marinate it for much longer than the original recipe suggests, in order to ensure that the entire block of tofu is flavored (4 hours is not quite enough for this beaut). Plus, I added more whiskey, because I don’t get the chance to cook with whiskey very often but I adore the flavor. This tofu roast is a beautiful main dish that would be perfectly at home on your Sunday supper table, Thanksgiving, Christmas, Easter, and more. 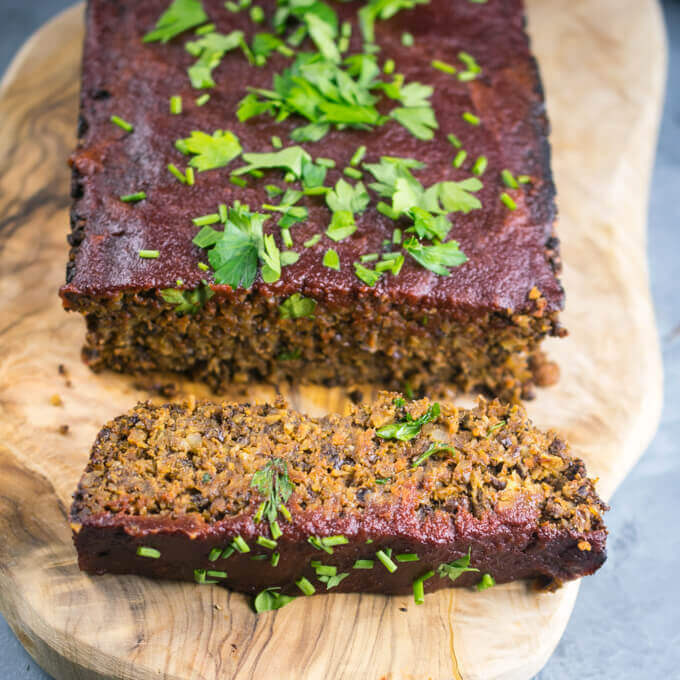 It’s more healthy than the traditional meat based roast and while it takes a little bit of waiting, it’s a breeze to make. Let’s do this! Detailed instructions included to help make your tofu roast a delicious, sticky, messy, scrumptious success! 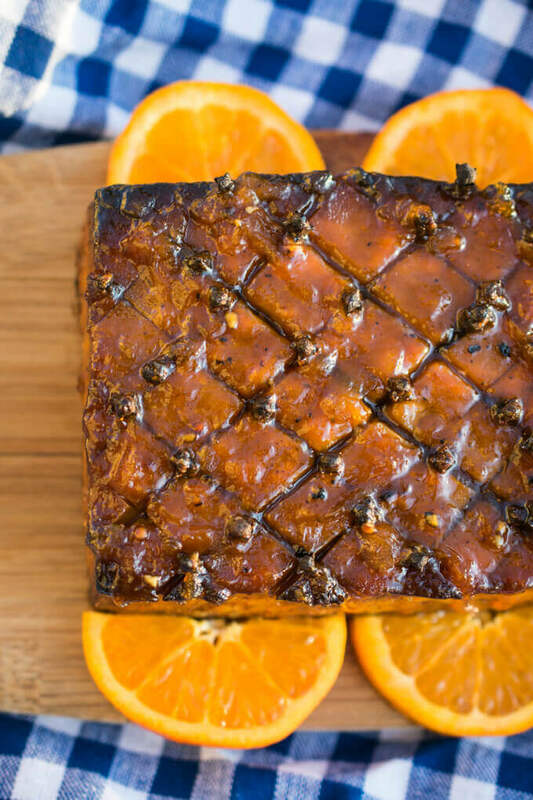 This glazed tofu roast is the baked tofu centerpiece of your dreams. 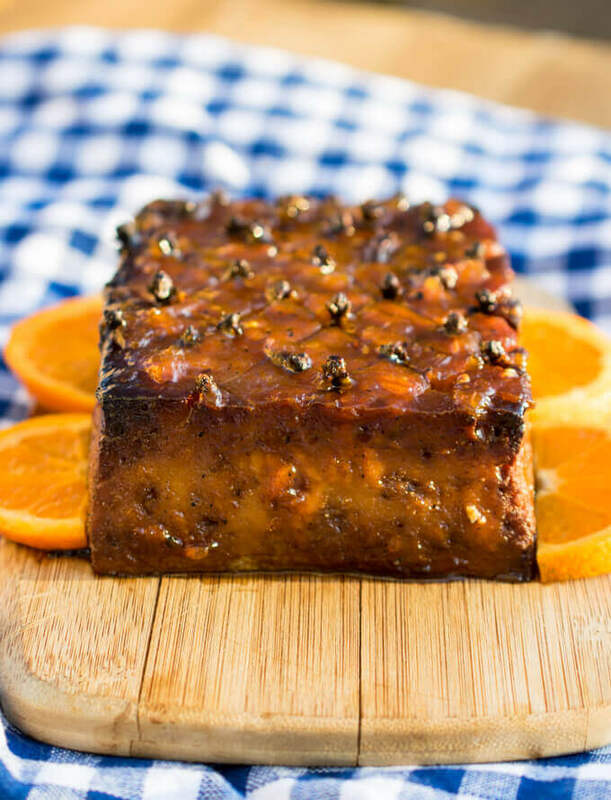 Prepared in a smoky-sweet marinade, slow-roasted and then covered in a spicy orange glaze, this is a succulent vegan roast that makes a beautiful holiday entree. The day before you want to eat the tofu roast, open the tofu, drain excess liquid, and then press it. I strongly recommend using a tofu press (mine is linked in the notes). If you make tofu with any regularity, it's totally worth owning. Otherwise, wrap it in a clean towel and stack some heavy objects onto it, like textbooks or a cast iron pan. For this recipe, it's really important to press the tofu very well, so if you're using the towel method, after 15 minutes, replace the towel with another dry one, and repeat. With a tofu press, 15-20min should do the trick. Whisk together all of the ingredients for the marinade. Place the block of tofu in the smallest dish that it fits in with room around the sides. A loaf pan or smaller is best. This allows the marinade to go up around the sides of the tofu and saturate its interior the most. Pour all of the marinade over your tofu block and cover it. Marinate for 24-36 hours. Flip over the block of tofu about halfway through this time, or more frequently if you can manage it. Each time, also spoon some of the marinade from the sides over the top. The goal is to get as much of the marinade into the tofu as possible. When the tofu has marinated and is ready to bake, preheat the oven to 375 degrees Fahrenheit, and line a small baking dish (9x13 or smaller) with parchment paper. I recommend using excess parchment paper to go around the sides a little bit, for the easiest cleanup later. Line the orange slices on the bottom and place the marinated tofu block on top of them. Take a small, sharp knife and score the top of the tofu in a diamond pattern. Place the individual whole cloves, round side up, in the intersections between the lines. Bake for 60 minutes. Start checking the tofu at 45 minutes and take it out sooner if the edges are getting too dark. It's normal for the oranges to burn; they won't be getting eaten. While the tofu is baking, add all of the glaze ingredients to a saucepan and stir to combine them and dissolve the sugar. Bring to a boil, then lower to a simmer and simmer for about 25-30 minutes, or until reduced by about half, thick and glossy, with some of the raw alcohol flavor cooked out. 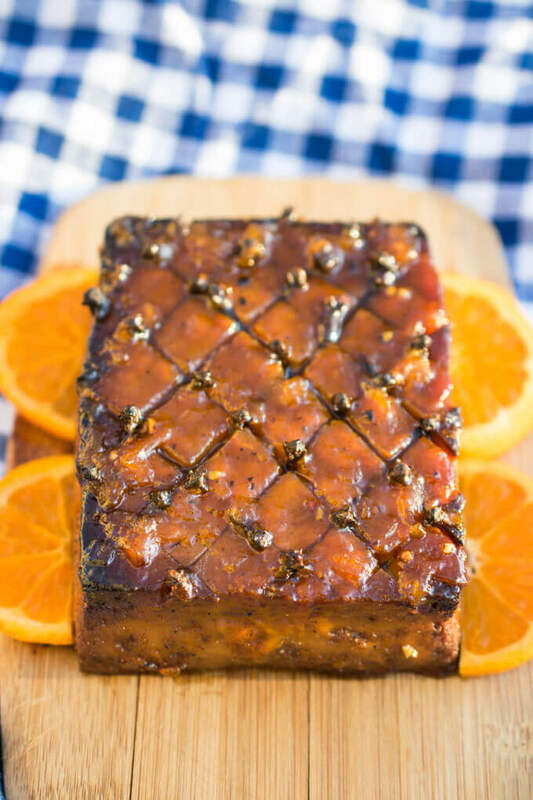 Let your tofu roast rest for about 15 minutes, then remove the cloves and burnt oranges, and feel free to dig in. I like to serve it on a new bed of fresh orange slices, but this is optional for serving, of course :). TOFU PRESS: This is the basic kind of tofu press and most brands are pretty interchangeable quality-wise. If you make tofu on a regular basis, I think it is well worth taking up cupboard space. Setup, cleanup, and results of pressing tofu are all superior when using one. EXTRA MARINADE: You'll have some marinade left over, since excess is needed in order to submerge the tofu. It's delicious tossed into a vegetable stir-fry, used to marinate tempeh, etc. You can even use it for rice paper bacon. If you're making two blocks of tofu, i.e. doubling the recipe, you will likely only need about 1.5x the marinade, so feel free to make a bit less. ALCOHOL SUBSTITUTE: I tried out substituting the whiskey with leftover extra marinade and it tasted great! NUTRITION: Nutrition facts are calculated using 2/3 of the marinade. My tofu absorbed a little over half of it, so I rounded up for good measure. 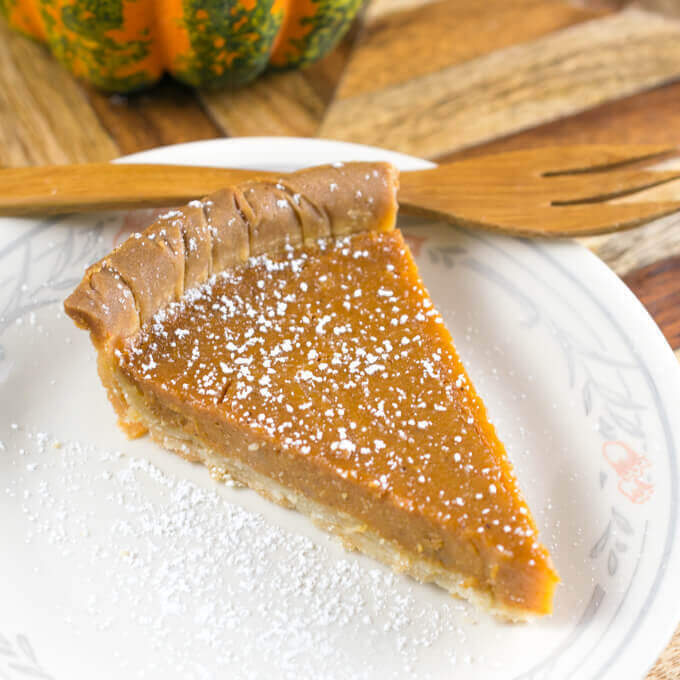 This recipe originally comes from the Superfun Times Holiday Cookbook, by the amazing Isa Moskowitz; rewritten with my instructions and modifications. 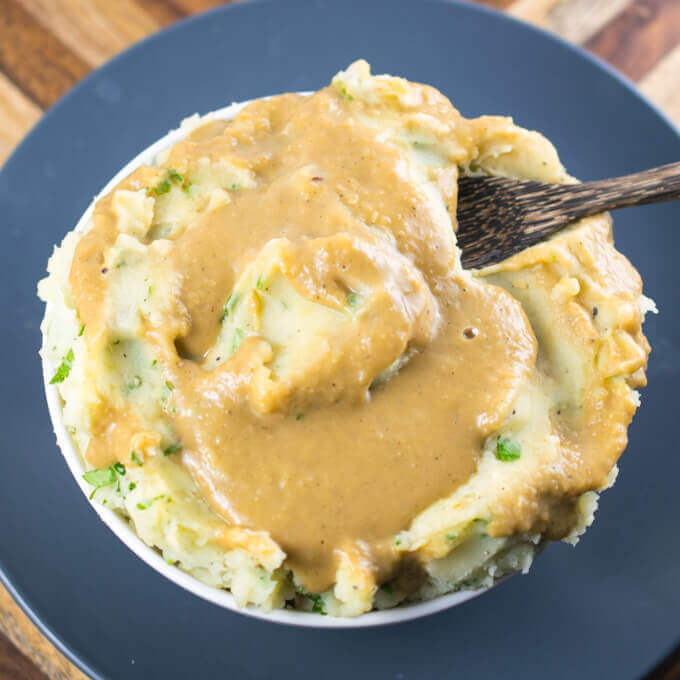 And I highly recommend some classic vegan gravy to top it all off! I’m thinking about making this for Easter, but would have to marinate it on Friday and bake it on Saturday, as I won’t have time to bake it on Easter. Does anybody have any experience with baking it the day before and reheating? Made this for Christmas dinner and it was delicious! One thing I really like about the recipe is that it uses everyday ingredients and I had almost everything on hand already. It’s also not complicated to make but has wonderful flavor. We will definitive be making it again! I made this for Christmas Eve dinner last night, and the tofu loaf was delicious! I found myself scraping off the glaze, though, because it was too sweet for me. Next time I will cut the brown sugar in half. I can highly recommend the Tofu Xpress tofu press. That comes with a cover piece and you can squeeze out the excess water, then marinate in the same press. You can flip it over without spilling, and there is enough room for the marinade to cover the tofu, so no worries about the tofu not being properly marinated. The Tofu Xpress sounds great! Thanks for the tip. It’s possible the glaze over reduced a little bit if the glaze tasted too sweet. Or, maybe your oranges were sweeter than mine, but of course, adjusting to taste is the way to go. Wow! I’ve never seen a tofu recipe quite like this. I’m so intrigued! Has anyone tried it without the oil? I’m thinking maybe I’ll sub veggie broth for the oil since I try to avoid processed oils. Thanks for the great recipe! Hey Taylor, hoping someone who has tried this can chime in. I felt the oil was necessary here – I worry that this dish would burn easily and not taste full flavored if the oil were omitted, but I hope that I’m wrong and would love to hear if you try it out. That really is a thing of beauty! It sure beats the standard brown log of faux meat. I wish I had seen this sooner for a Thanksgiving feast. It was so easy to make and I didn’t have to make any effort to make it look great and it still looked like I was an established cook, not to mention that it was very flavorful. Will definitely make it often. How much sodium is in this recipe? Sounds and looks amazing. But I really don‘t like smoked taste. Any suggestion what to use instead of the liquid smoke? Or just skip it? I’m so happy I made this! It was a great addition to the thanksgiving table, very popular! Minimal work involved too. I marinated for nearly 36 hours and used a few extra splashes of bourbon. Winner! I definitely, definitely recommend a tofu press to anyone!! I don’t use alcohol; do you have a suggestion for an alternative to the whiskey? This sounds and looks amazing! Hey Alicia, I tried it out using an equal amount of leftover marinade in the glaze instead of the whiskey and we thought it was still really tasty!